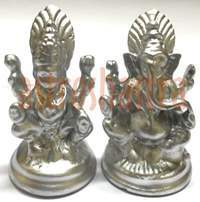 Lord Ganesha and Maa Lakshmi idols made in solidfied mercury bestows wealth and prosperity. 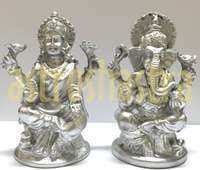 Ganapati or Ganesha, the Lord of Ganas, the elephant faced God, represents the power of the Supreme Being that removes obstacles and ensures success in human endeavors. 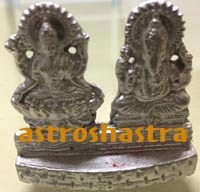 He is worshipped for siddhi, success in undertakings, and buddhi, intelligence. He is worshipped before any venture is started. He is also the God of education, knowledge and wisdom, literature, and the fine arts. Maa Lakshmi bestows the wealth upon sadhak. 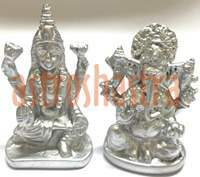 Daily puja of Parad Lakshmi Ganesha removes financial as well as all difficulties of life. 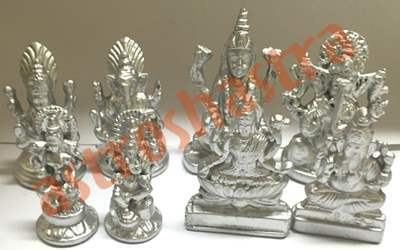 Astroshastra provides you the authentic and the idols are energized in your name , before sending it to you. Please feel free to contact us on 0-91-9871921188 for any clarification or information in this regard. 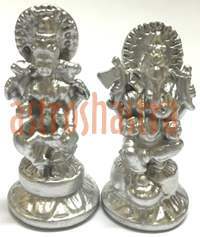 Parad Lakshmi Ganesh (1.350 Kg)approx.